Alpha rotary switch. Solid 1/4" shaft. 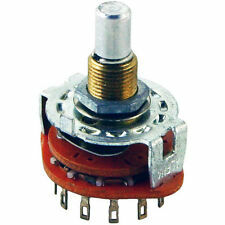 The EC11 rotary encoder has 20 positions per revolution. Inside the encoder there are two switches. One switch connects pin A to pin C and the other switch connects pin B to C. In each encoder position, both switches are either opened or closed. 1 x 32 amp 4 pole Rotary Isolator Switch. Weatherproof rated to IP65. Solid plastic construction with 20mm cable entry knockouts. Handle padlockable in the off position. 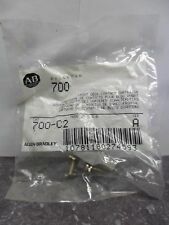 Standards EN60947 and CE marked. Pair of Alps EC16 Rotary Encoder w/Switch - New! 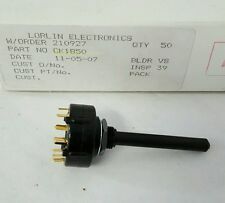 Can't find a datasheet, so no exact part number. PC Mount solder pins, rear facing. 24 pulses per revolution. 24 Detents. 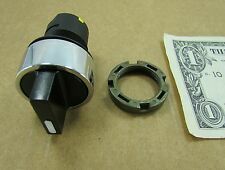 This is for 1 piece of an OHMITE 412-3 - 1 Pole 3 Position 50A 300Vac. 1 866 4 - APEX JR. -- 1 866 427-3957. 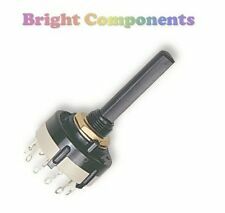 Brand new, high quality rotary switch with break before make (non-shorting) mechanism. Ideal for general purpose use. With panel mounting washer nut. Quantity : 1 Switch Action : Rotary Switch Type : 3 Pole 4 Way (4 Positions) Maximum Rating : 0.3A at 125Vac Maximum Contact Resistance : 50mO Minimum Insulation Resistance : 100MO @ 500V DC Dialectric Strength : 500V AC for 1 min Operating Temperature Range : -30°C to 85°C Mounting hole Size : 10mm Body Diameter : 26mm Shaft Length : 29mm (with flat edge) Shaft Diameter : 6.35mm (1/4") Terminal Type : Solder Tag . The EC11 rotary encoder has 20 positions per revolution. Inside the encoder, there are two switches. One switch connects pin A to pin C and the other switch connects pin B to C. In each encoder position, both switches are either opened or closed. 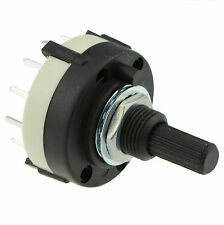 10-Position Rotary Switch with Knob. Switch Action: Maintained (Stays Switched). 1/4" Shaft, 4/25" Pin Spacing. UL Recognized Switch. -Passed stringent tests for safety and code compliance in US and Canada. Price is for 1 ea. MBB - Make Before Break (shorting). Rotary Switch. High Quality CK Rotary Switch. 3 Pole 4 Position. Make Before Break. The mounting nut is included. Rated 150mA @ 250v ac/dc resistive load. 4 Position. 2 Position Maintained rotary switch, 2 NO auxiliary connectors. Bore hole dia: 22mm. 380VAC: 2.5A. 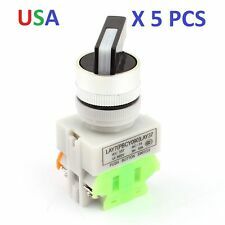 (One 2P6P Double Pole Six Position Single Layer Rotary Wafer Switch. Solder Lug, Panel Mount, 1 Washer, 1 Nut. 3A/30Vdc, Make Before Break. 1/4”) Knurled slotted straight shaft. Rotary 3/8" Brass Knob. 6A 125-250V. 5X 3 Pole 4 Position design, ceramic structure, easily turned. Widely used on radio, TV, industrial machine control unit, or other electronic devices. Fit Mounting Hole Diameter : 9mm / 0.35";Rotating Shaft Dia : 6mm / 0.24" Pin Number : 15 Dimensions : 2.7 x 3.8cm / 1.1" x 1.5"(Max.D*H) Material : Metal, Plastic;Net Weight : 10g Voltage AC: 250V, rated current: 0. DKJ-Y1 20A 125V 10A/230V AC MAXMUM. MBB - Make Before Break (shorting). Rotary Switch. 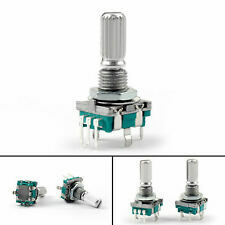 High Quality CK Rotary Switch. Single Pole 12 Position. Make Before Break. The mounting nut is included. 12 Position. Rated 150mA @ 250v ac/dc resistive load. A quality motor reversing switch similar to the "Dewhurst" type commonly found on Myford and Boxford lathes. Motors are normally hard wired to be able to run in either forward or reverse direction, with this triple pole switch you can run in either direction at the flick of the switch! Rotary Switch. High Quality CK Rotary Switch. 2 Pole 6 Position. Break Before Make. BBM - Break Before Make (non-shorting). The mounting nut is included. Rated 150mA @ 250v ac/dc resistive load. 6 Position. Depth 200 mm. Height 380 mm. 5 PCS LAY7(PBCY090)LAY37. ROTARY TWO (2) POSITION SELECTOR. TWO SWITCHING CIRCUIT ; BOTH NORMALLY OPEN ( SINGLE POLE - SINGLE THROW ). SWITCH POWER IGNITION. 2-POSITIONS ;ON, OFF. 1 PC LAY7(PBCY090)LAY37. ROTARY THREE (3) POSITION SELECTOR. THREE SWITCHING CIRCUIT ; BOTH NORMALLY OPEN ( SINGLE POLE - SINGLE THROW ). SWITCH POWER IGNITION. 3-POSITIONS ;OFF / ON, OFF / OFF, OFF / ON. The Rotary Handle Switch is mainly used in industrial.The two position rotary switch is used in industrial controlling circuits for controlling in electromagnetic starter, Contactor, Relay and other electric circuits.It has the advantages of safety, longevity, reliability and excellent design,harmonious in colour,design and function.Contact Type : 1 NO(Normal Open);Selector Button Position : 2 Position;Selector Button Diameter : 29.5mm / 1.2";Mount Hole Diameter : 21.5mm /0.85" Fit Panel Thickness : Max 5mm / 2";Handle Size : ~28 x 14mm/ 1.1" x 0.55" (L*H);Overall Size : ~40 x 30 x 70mm/ 1.6" x 1.2" x 2.8" (L*W*H);Material : Plastic, Electronic Parts Color : Black & White;Weight : 40.3g;Package Content : 1 x Rotary Switch Brand U.